Now you can cut perfect tomato slices every time. The blade of the Rada tomato slicer is specially manufactured with dual serrations to make sure every cut is straight and even. And it works for left-handers too. 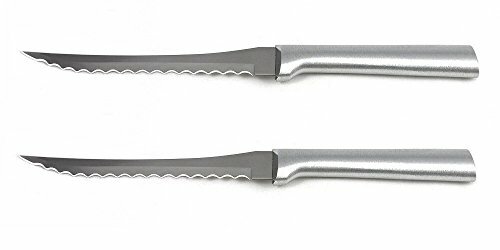 Package of 2 tomato slicers. Rada knives are super sharp, handcrafted in the USA. Rada cutlery is made of surgical quality, high carbon stainless steel. The aluminum handles create a "feel good in your hand" balance for superior comfort. Hollow-ground blades ensure a precision concave surface for maximum edge retention and sharpness. Hand wash and dry immediately after use to prevent discoloration of the aluminum handle. If you have any questions about this product by Rada MFG, contact us by completing and submitting the form below. If you are looking for a specif part number, please include it with your message.